Translator’s Note: Grand Master Chan Tin Sang (陳天生) [1924-1993] requested that when the time was right, this text should be translated into the English language to assist all future Taijiquan practitioners in the West perfect their art. This is a new English translation of the Chinese language text entitled ‘《太極拳經》 張三丰’, or ‘Taijiquan Classic By Zhang Sanfeng’, which comes through the Yang (楊) School of Taijiquan. The particular text used in this translation is preserved within the (ethnically Hakka Chinese) Ch’an Dao Martial Arts School, and acquired through the Yang Chengfu lineage of the Yang School. Where necessary, I have added clarification of the philosophical terms found in this text, to assist the general reader build a picture of the cultural world the author inhabited. I have also minutely analysed each Chinese language ideogram where required, to provide extra clarity regarding otherwise obscure or unfamiliar terms, as the Taijiquan Classic is considered the basis of all Taijiquan texts. I have also referenced contemporary Chinese language research texts about Taijiquan, a short list of which has been added to the end of this translation, and I retain the original Chinese language text. It is important to understand that it is literally believed within the Yang School that the Daoist Immortal Zhang Sanfeng wrote this text, and there is no reference to the story (preserved in other Taijiquan lineages), that the Taijiquan ‘Classical’ texts were discovered in a Salt Shop in 1852, etc. This is a logical assumption from a Chinese academic perspective, as ample references to the existence of Zhang Sanfeng can be found within Chinese language historical records, more or less unexplored (or ignored) by Western researchers. Needless to say, the weight of evidence in China points to the existence of Zhang Sanfeng (primarily during the Ming Dynasty, although with some reference to the Song and Yuan) and it would be highly illogical to assume that he did not exist. Furthermore, the likelihood that he developed the basis of Taijiquan is also recorded and available for assessment. The Western notion, (commonly found within non-Chinese language Taijiquan research), that a priori assumes that Zhang Sanfeng does not exist, is something of a well established Eurocentric myth. The ancient philosophical term of ‘Taiji’ (太極) can be traced to the ‘Great Treatise’ (Da Zhuan) section of the ancient ‘Change Classic’ (易經 – Yi Jing), comprising the 5th and 6th chapters of the Ten Wings (十翼 – Shi Yi) commentaries associated with that book. The great sage Confucius (孔夫子 – Kong Fu Zi) [551 – 479 BCE] is believed to have made a study of the Change Classic, and to have personally penned the philosophical content of the Da Zhuan, although it is also speculated that his students (or even grand-students), added this information in the name of their teacher, sometime after his passing. Whatever the case, the Da Zhuan had developed its received structure by around 300 BCE (around the time of the rise of the Yin-Yang School). This would suggest that the term ‘Taiji’ could not have been developed any later than 300 BCE, that is toward the end of the very violent and bloody Warring States Period. Curiously, in the Mawangdui Tomb version of the Yijing, (dated to around 168 BCE), the term ‘Tai Ji’ [太極] is replaced in the ‘Appended Statements’ section with the term ‘Da Heng’ [大恆], or ‘Great Constancy’. The Mawangdui Tomb also contained a silk painting depicting numerous martial-like health-giving postures and techniques, many of which look remarkably similar in principle to those that comprise contemporary Taijiquan (太極拳) practice. From ancient times in China, up until the 18th and 19th centuries CE, myth and legend abound about Taijiquan-type martial arts that used similar movements but were known by other names. It is entirely plausible that an early ‘internal’ martial arts was founded thousands of years ago, premised upon the principles found within the Change Classic (Yijing), the Daoist Classics, and other Treatises such as Sunzi’s Art of War, etc. This is an entirely logical supposition premised upon extant knowledge, as China possessed many different and varied martial styles of very ancient origination. For instance, the premise of an early Taijiquan-like healing martial art can be found in the movements associated with the art of Yangshengfa (養生法) or ‘Nourishing-Life Law’, which was in existence from at least the early 4th century BCE in China. This art used various postures including bending, expanding, condensing and extending, coupled with deep breathing and qi-energy circulation. Judging from the content of training manuals said to have existed around this time, these movements (and breathing exercises) were premised upon the movements of animals. During the Liang Dynasty (502–587), and Tang Dynasty (618-907) there already existed a Taijiquan-like martial arts, with names such as the ‘Thirty-Seven Postures’ (三十七势 – San Shi Qi Shi), ‘Later Divine Sky Law’ (後天法 – Hou Tian Fa), and ‘Small Nine Divine Sky’ (小玖天 – Xiao Jiu Tian). The ‘Taijiquan Classic’ – the text that is the subject of this translation – is attributed to the Daoist Immortal known as Zhang Sanfeng (張三丰). Modern Chinese scholarship states that the birth and death dates for this Daoist priest are uncertain, although some sources tentatively suggest 1279-1368, and there is a story that he in fact lived more than 250 years. If these dates are accurate, then Zhang Sanfeng lived during the (foreign) Yuan Dynasty (1271-1368), although if he had an extraordinary life-span, (such as that expected of outstanding Daoists), he would have lived well into the Ming Dynasty (1368-1644) – transcending the physical realm in the year 1521. 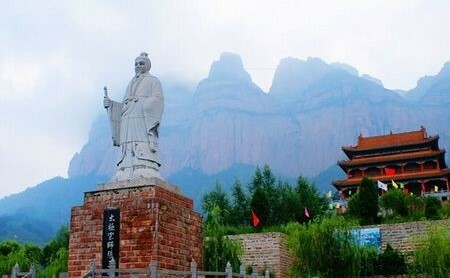 Although the historicity is open to question due to its lack of clarity, it is said that Zhang Sanfeng was an outstanding scholar who studied the Shaolin martial arts before retiring from the world and dedicating himself to Daoist self-cultivation on the Wudang Mountain. During this time, it is believed that he refined the Shaolin martial techniques, and developed the purely ‘internal’ approach now associated with modern Taijiquan practice. In the ‘Taijiquan Classic’, Zhang Sanfeng refers to his art as ‘Long Fist’ (長拳 – Chang Quan), and it is an interesting speculation as to whether this may refer to the well-known Shaolin style of that name – albeit in the modified form he had created, premised upon ancient Chinese philosophical systems. Certainly by the 16th century, General Qi Jiguang (1528-1588) of the Ming Dynasty was including Taijiquan-like movements in his famous manual entitled ‘Record of Military Training’ (練兵實紀 – Lian Bing Shi Ji), comprising of 32 martial movements – 16 ‘internal’ and 16 ‘external’. Indeed, Chen Ziming (陈子明) [d. 1951], a 17th generation descendent of the Chan Family Clan of the Chen Village (situated in the Chenjiagou area of Henan province), and a 9th generation inheritor of the Chen Style of Taijiquan, is of the opinion that his family’s martial art was created by Chen Wangting (陈王庭) [1580–1660], who made use of the movements recorded in General Qi Jiguang’s manual. However, another version of the origination of Taijiquan states that a disciple of Zhang Sanfeng named Wang Zongyue (王宗岳) taught Chen Wangting the Wudang art, and that this is how the Chen family acquired the martial system that would become known as ‘Taijiquan’. Of course, General Qi’s manual is comprised of a collection of martial techniques extant at the time of its writing, gathered from many different styles. Modern scholarship suggests that the specific term ‘Taijiquan’ (太極拳) was first used during the reign of the Qing Dynasty Emperor Qianlong (r. 1735-1786). Yang Luchan (杨露禅) [1799-1872], is said to have learned his ‘Chen Family Style’ of Taijiquan from Master Chen Changxin (陳長興) [1771-1853], of the Chen Village situated in the Chenjiagou area of Henan province. Master Chen Changxin was a 14th generational descendant of the Chen Family Clan, and 6th generational Taijiquan master. Yang Luchan broke with the old tradition of never teaching outside one’s own family or clan, and is responsible for popularising Taijiquan, which eventually spread around the world. Taijiquan is a Chinese martial art with Chinese cultural roots, that developed through the auspices of the Chinese language system (both oral and written). Obviously, in recognition of this fact, I reject the Eurocentric habit of denigrating Chinese traditional knowledge and its associated history (such as that found in the work of such Westerners as Stanley Hemming, Brian Kennedy and others, etc), as being a manifestation of poor academic method, and start from the basic premise that it is from Chinese language academic sources that the answers about Taijiquan will emerge, being as it is, a product of the Chinese cultural milieu. 極 (ji2) = Ridge-pole, extreme, highest, top-most, or furthest. 拳 (quan2) = Fist, boxing, sparing or martial strength. 經 (jing1) = Classic books, religious scriptures, or books of significant value, containing wise rules and sound regulations (upon any subject) that are intended to endure for all time. Literally the warp thread on a loom that (defines the design) and holds the entire structure together. The ‘Grand-Ridge-pole’ holds-up the divine sky and presses down the broad earth. The ‘Grand Ridge-pole’ supports and defines the entire universe, with humanity existing below the divine sky and upon the broad earth. For the universe (and all life within it) to be healthy, vibrant and content, qi-energy (氣) must flow unhindered through its entire structure (mediated by the ‘Grand Ridge-pole’ which is synonymous with the human ‘spine’), and exist in a state of unobstructed abundance. Obstructed qi-energy in the mind, body and environment leads to stagnation, illness, and degradation. When these obstructions are cleared, health and nature functions correctly and without stultification. This concept probably emerged from a granary in old China that was round in structure with its roof held-up by a single, central pillar (極 – ji2). Later, grand houses would also be built containing a large, robust and impressive central pillar holding-up the roof of the main room. As a ‘closed fist’ (拳 – quan2), the indication is that it is vastly superior to other, more mundane martial arts, as it is based upon a universal blue-print that although combat effective, it actually engages the practitioner in building good psychological and physical good health, whilst pursuing a moral path in the world that prevents wanton violence, and keeps good qi-energy flowing through all existence. The martial movements of Taijiquan are simultaneously masterful in countering human aggression, whilst unblocking hindered qi-flow and permanently working for the establishment and maintenance of good health. The act of combining correct posture and movement with breathing deeply and fully, strengthens the link between the individual and the environment (i.e. ‘universe’). Power comes not from anger or hatred in the mind, or excessive muscular tension in the body, but rather by dropping the bodyweight into the ground (creating a ‘rooted’ stance), whilst remaining ‘light’ in movement (and emitting a powerful force in all directions). The martial art of Taijiquan represents a robust and centralised perfection of balance that is inclusive of all things, and which serves, through its rounded alignment of posture and correct timing and positioning, to reduce all imbalances to its own inherent, perfected state. A master of Taijiquan rolls unhindered across the ground like an iron ball that no force can stop, but which dissolves all obstructions in its path. The entire body moves in an integrated manner, and is directed by a buoyant (and expansive) spiritual (ling) awareness. All movements are held together, as if threaded upon a single cord. The qi-energy should be strongly aroused (and energised), whilst the internal (empty) spiritual essence (shen) is gathered, and concentrated (in an all-pervasive manner). The distinct postures should be free of any technical error, and there must be no sudden (and disconnecting) movement that collapses the postural (i.e. ‘skeletal’) alignment of the body either inward (toward the centre) or outward (away from the centre), and which interrupts the already steady flow of the movement. The feet are rooted to the ground, whilst the bodyweight is dropped (and released) through the legs. This process is controlled and directed through the waist and manifests through the hands and the fingers. The feet, legs and waist are integrated through the cultivation of an expanded awareness that generates a unified field of qi-energy. Whether the stance-work advances or retreats, the positioning and timing is always co-ordinated and powerful. If the positioning and timing is not co-ordinated properly, the postural alignment of the body is compromised, and all co-ordinated power is lost. In such a situation, the (alignment) error must be found within the (positioning) of the waist and legs. When all the postures are properly aligned and co-ordinated, the bodyweight drops (unhindered) through the waist, legs and feet, rooting the practitioner to the ground, and the subsequent movement, whether up or down, front or back, left or right, are all without difference. This is because all difference is reconciled in the attainment of expansive ‘intention’ (yi), which has no basis in (dualistic and confusing) externality. If there is up, there is down. If there is forward, there is back, and if there is left, there is right. If ‘intention’ (yi) is directed upward, it has simultaneously implicit within it, the ability to be directed downward. If this (combined psycho-physical) ‘force’ (li) is correctly applied to an opponent in self-defence, by alternating between projecting force and withdrawing force, then without a doubt, the ‘root’ of the opponent will be instantly ‘cut-off’, and the threat quickly removed (as the opponent cannot ‘stand’ to muster resistive strength). There should be a clear understanding of (and distinction between) the state of ‘emptiness’ (xu) – (when bodyweight and concentrated force is absent from part of the body), and the state of ‘fullness’ (shi) – (when bodyweight and concentrated ‘force’ is present in part of the body), as these two states should manifest and alternate here and now, and be present (and applied) to each and every situation. When (Taijiquan) technique is mastered, all parts of the body are co-ordinated (as if strung together on a single cord), and there is no break (anywhere) in the flawless continuity, during the practice of the integrated movements. 1) 掤 (peng2) – The left-hand particle of ‘扌’, is a contraction of ‘手’ (shou3), referring to the use of an ‘open hand’. The right-hand particle is ‘朋’ (peng2), which denotes the wings of a large bird – that possesses the power to create expansive and rising force with a flap of its wings (the type of cultivated power that Taijiquan technique generates in the arms and hands, during the exercise of ‘warding-off’). 3) 挤 (ji3) - The left-hand particle of ‘扌’, is a contraction of ‘手’ (shou3), referring to the use of an ‘open hand’. The right-hand particle is ‘齐’ (qi2), and refers to a field of wheat that has grown to an ‘even’ or ‘equal’ height. This implies a hand that is used to press, to squeeze, or to wring-out whilst using an ‘even’ pressure. This ‘pressing’ and ‘twisting’ motion is applied in such away so as to remove all discord in the situation by making all things ‘equal’. 4) 按 (an4) - The left-hand particle of ‘扌’, is a contraction of ‘手’ (shou3), referring to the use of an ‘open hand’. The right-hand particle is ‘安’ (an1), which denotes a woman within a house. Through the good nature of a woman, peace and tranquillity manifest in the world. A hand that is used to ‘stop’, ‘halt’ and ‘control’. A hand that ‘follows’ and ‘examines’ but which does not get ‘caught’ or remain ‘static’, is able to ‘push’ without undue effort, and attain its objective without resistance. 6) 挒 (lie4) - The left-hand particle of ‘扌’, is a contraction of ‘手’ (shou3), referring to the use of an ‘open hand’. The right-hand particle is ‘列’ (lie4), which combines ‘歹’ (dai3) or ‘bone’ (i.e. the ‘remains’ of a body) – with ‘刂’ (dao1), or ‘knife’. The implication is that the dead body is cut-up in an expert manner with the use of a knife. There are no wasted strokes, and the Taijiquan meaning is that the hand is used to create order in the world by clearly ‘distinguishing’ (or ‘splitting’) everything into its proper place, whilst ensuring, through correct placement, that everything remains in its proper position. 7 肘 (zhou3) - The left-hand particle ‘肉’ (rou4) [contracted to ‘月’] refers to a rack of ribs – as in ‘meat’, whilst the right-hand particle ‘寸’ (cun4) indicates an open hand with the fingers apart. This ideogram refers to an ‘elbow’, or the hard boney area in the middle of the arm – situated between two areas of muscle and flesh. The art of Taijiquan emphasises the use of the elbow to ‘intercept’, ‘check’ or ‘catch’. 8) 靠 (kao4) - The upper particle is ‘告’ (gao4), which is comprised of a ‘cow’ in the top element (牛) [niu2], and ‘口’ (kou3) in the bottom element, which signifies a cow making noise (as in raising an alarm, or drawing attention to a situation). The lower particle ‘非’ (fei3) carries the ancient meaning of ‘broken wings’, and is used to indicate the ‘absence’ of something (as in ‘no’, ‘negative’ not to be’, etc). Within Taijiquan, this refers to making use of the shoulder, (left and right), which momentarily ‘attends’ to the opponent by applying ‘leaning’ pressure to check, re-direct and ‘break-up’ an attack. a) 進步 (jin4bu4) – Literally ‘forward step’, ‘progressive step’ or ‘advancing step’. The ideogram ‘進’ (jin4) is comprised of the left-hand particle ‘辶’ (chuo4) which denotes feet walking along a road, whilst the right-hand particle ‘隹’ (zhui1) denotes ‘short-tailed bird’. When placed together in ‘進’ (jin4), there is present the positive ideas of ‘moving forward’, ‘progressing’ ‘improving’ and even ‘entering’ (like a person on a journey, or a bird taking flight). The ideogram ‘步’ (bu4) is comprised of the upper particle of ‘止’ (zhi3), which usually denotes a stationary foot, but in this instance, it is augmented by the lower particle of ‘少’ (shao3), which indicates that both feet are moving forward, taking a small or definite number of steps. Therefore, the Taijiquan meaning of ‘進步 (jin4bu4)’ is ‘stepping forward’ in a clearly defined and co-ordinated manner, a process guided by the boundaries that define the ‘correct’ practice of Taijiquan technique. b) 退步 (tui4bu4) – Literally ‘backward step’, ‘regressive step’, or ‘retreating step’. The ideogram ‘退’ (tui4) is comprised of the left-hand particle ‘辶’ (chuo4) which denotes feet walking along a road, whilst the right-hand particle ‘艮’ (gen4) not only refers to the 7th trigram of the Classic of Change (that denotes a ‘mountain’), but is also written (in the lower particle) as a man facing right ‘匕’ (hua4). The upper particle is ‘目’ (mu4), which denotes an ‘eye’. A man facing right is walking ‘out’ of the ideogram (because he can clearly see which way to go), and so the meaning of ‘retreat’ is generated. The ideogram ‘步’ (bu4) is comprised of the upper particle of ‘止’ (zhi3), which usually denotes a stationary foot, but in this instance, it is augmented by the lower particle of ‘少’ (shao3), which indicates that both feet are moving forward, taking a small or definite number of steps. Therefore, the Taijiquan meaning of ‘退步 (tui4bu4)’ is ‘stepping back’ in a clearly defined and co-ordinated manner, a process guided by the boundaries that define the ‘correct’ practice of Taijiquan technique. c) 左顧 (zou3gu4) – Literally ‘left look, left gaze, and ‘look east’. The ideogram ‘左’ (zou3) is comprised of the left-hand particle ‘’ (you4) symbolises a ‘right hand’, and the right-hand particle ‘工’ (gong1) conveys the meaning of ‘work’. Traditionally, the ideogram ‘左’ (zou3) refers to an action (or activity) taking place to the ‘left’. The ideogram ‘顧’ (gu4) is comprised of the left-hand particle ‘雇’ (gu4), which is comprised of the top element ‘户’ (hu4) meaning ‘door’, ‘family’, or ‘household’, and the lower element ‘隹’ (zhui1) denoting a ‘short-tailed bird’. The right-hand particle is ‘頁’ (ye4), which in its original form refers to the ‘head’. The ideogram ‘雇’ (gu4) is taken to imply the correct positioning of the head, so that the ‘vision’ may clearly perceive all that it discerns. Therefore, the Taijiquan meaning of ‘左顧 (zou3gu4)’ is to ‘gaze authoritatively to the left’, so that the door and the short-tailed bird are clearly perceived in the environment by positioning the head (and body) correctly (so as to discern all environmental objects), in a clearly defined and co-ordinated manner, a process guided by the boundaries that define the ‘correct’ practice of Taijiquan technique. d) 右盼 (you4pan4) – Literally ‘right look, right gaze’, and ‘look west’. The ideogram ‘右’ (you4) is comprised of the left-hand particle ‘又’ (you4) which represents a ‘right hand’, and the right-hand particle ‘口’ (kou3) which symbolises an ‘open mouth’. The person who ‘talks’ is to the ‘right’ of the hand that guides, therefore the ideogram ‘右’ (you4) refers to actions that originate to the right (literally ‘not left’). The ideogram ‘盼’ (pan4) is comprised of the left-hand particle ‘目’ (mu4) which means ‘eyes’ or ‘vision’, and the right-hand particle ‘分’ (fen1) which denotes a ‘knife’ or ‘sword’ (刀 – dao1), that cleanly cuts thing up into ‘eight’ (八 – ba1) pieces. This is why the ideogram ‘盼’ (pan4) refers to a developed act of visual perception that not only clearly perceives, but which also penetrates deeply (like the act of ‘cutting’) into the myriad objects of the outer world. Therefore, the Taijiquan meaning of ‘右盼 (you4pan4)’ is to ‘profoundly penetrate (with a developed visual perception) the objects of the outer world, whilst (in this instance) looking to the right’, in a clearly defined and co-ordinated manner, a process guided by the boundaries that define the ‘correct’ practice of Taijiquan technique. ‘中’ (zhong4) interpretation, it refers to an arrow cleanly penetrating the centre of a target. This is why this ideogram carries the meaning of ‘adhering’ to, and ‘penetrating’ the centre with a well profound accuracy and cultivated ease. The ideogram ‘定’ (ding4) is comprised of the upper particle ‘宀’ (mian2), which represents a ‘roof’, and the lower ideogram ‘疋’ (pi3) which denotes a length of cloth cut to a definite and specific ‘fixed’ length. This is a variant of ‘正’ (zheng4), that refers to a virtuous person who holds the authority to ‘fix’ legal limits, and mete out judicial punishments. This is why the ideogram ‘定’ (ding4) holds the meaning of ‘deciding’, ‘fixing’ and to ‘settle’. Therefore, the Taijiquan meaning of ‘中定 (zhong1ding4)’ is to ‘adhere to the centre’ and always ‘penetrate the middle’, that is both psychological as well as physical. This suggests the disciplining of the mind by ‘fixing’ its attention to the centre of perception, and the centralised balancing of the body (which is never abandoned) in a clearly defined and co-ordinated manner, a process guided by the boundaries that define the ‘correct’ practice of Taijiquan technique. Therefore, these eight positions and five steps comprise the thirteen principles of Taijiquan training. An original note states: The Founding Master (Patriarch) of Wudang Mountain – Zhang Sanfeng (張三丰) – has left this authoritative Treatise (lun). All beings existing under the divine sky (tianxia) must heroically strive (through the correct practice of Taijiquan) to cultivate robust health and realise the State of Immortality (here and now). The martial techniques (of Taijiquan), although premised upon (an advanced form of) self-defence, are primarily designed to positively (and permanently) enhance the functionality of the inner biological processes, whilst simultaneously strengthening the outer structures of the body.